Ant-dipping is a tool-use behavior targeted at biting and gregarious army ants (Dorylus spp.). Although several wild chimpanzee communities exhibit this behavior, some do not, although army ants are ubiquitous across Africa. This tool-use behavior is often cited as one of the best examples of culture in chimpanzees. Nevertheless, recent data emerging from Bossou in southeastern Guinea and detailed entomological analysis of the army ant species available at different chimpanzee study sites, as well as direct observations of this behavior, indicate that the aggressiveness and the density of the ant species influence tool length and the technique employed to consume the ants off the tool. Behavioral differences persist, however, between the communities of Taï, Côte d’Ivoire, and Bossou, where the same species of army ants are consumed by the chimpanzees. A comparative study indicates that these variations in ant-dipping between these two long-term field sites cannot solely be explained on the basis of prey behavior, characteristics, and availability and must therefore be cultural. 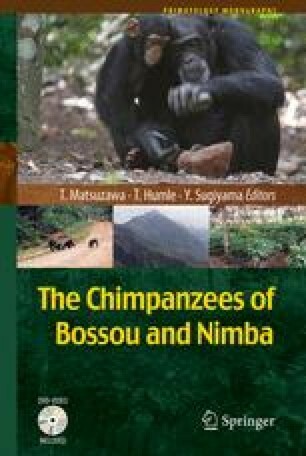 A longitudinal study of the acquisition of ant-dipping among the chimpanzees of Bossou supports this assertion by revealing the importance of social influences and the role of the mother in the learning process of young chimpanzees. Finally, studies of ant-dipping, especially at Bossou, have demonstrated a narrow interrelationship between ecology, social learning, and culture. The online version of this chapter (doi: 10.1007/978-4-431-53921-6_10) contains supplementary material, which is available to authorized users. I wish to thank the Ministère de l’Enseignement Supérieur et de la Recherche Scientifique, in particular the Direction Nationale de la Recherche Scientifique et Technologique (DNRST) and the Institut de Recherche Environnementale de Bossou (IREB), for granting me the permission to carry out research at Bossou. I am particularly grateful to Tetsuro Matsuzawa, Charles Snowdon, and William McGrew for their advice and support, and to Caspar Schöning, Kathelijne Koops, Gaku Ohashi, Gen Yamakoshi, Yasmin Möbius, Christophe Boesch, and all the local assistants at Bossou for their invaluable contributions and collaboration. Finally, I would like to acknowledge the financial support of the Ministry of Education, Science, and Culture, Japan (nos. 07102010, 12002009, and 10CE2005 to T. Matsuzawa), a Leakey Foundation Grant, and an NIH Kirschstein-NRSA Postdoctoral Fellowship (no. MH068906-01) to T.H.